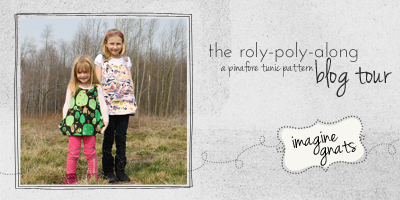 Have you seen the Roly Poly Pinafore pattern by Imagine Gnats? It’s a super cute, simple and versatile piece that is perfect for layering, adding fun details and showcasing awesome fabrics. 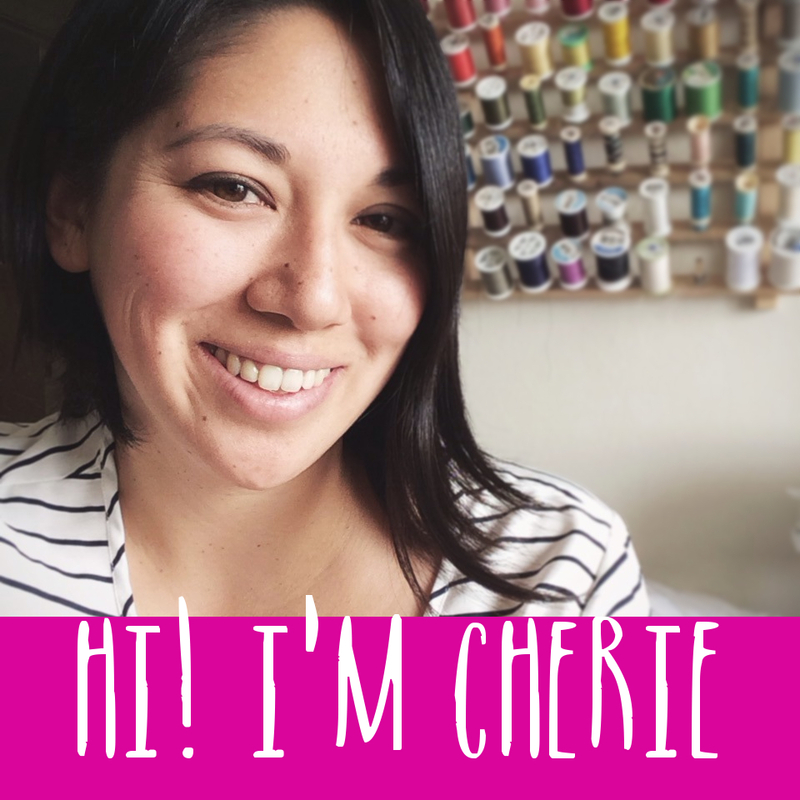 Rachael of Imagine Gnats and the creator of this pattern has rounded up some of her friends to help show off all their versions of this fun pinafore! 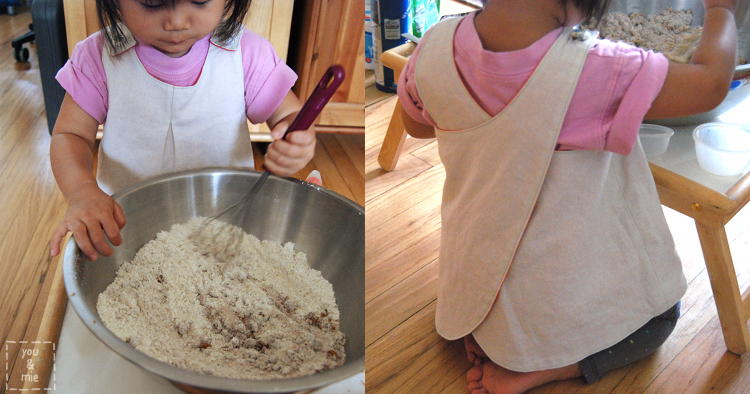 I decided to make one for Yuki to use as an apron/art smock! 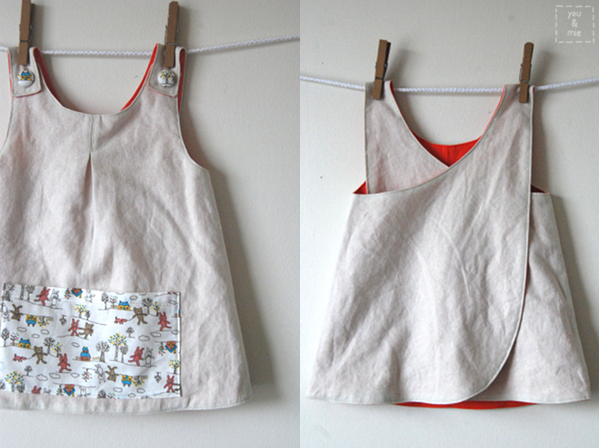 The pinafore is fully reversible, and one of the best parts is begin able to mix and match and pair fabrics together. 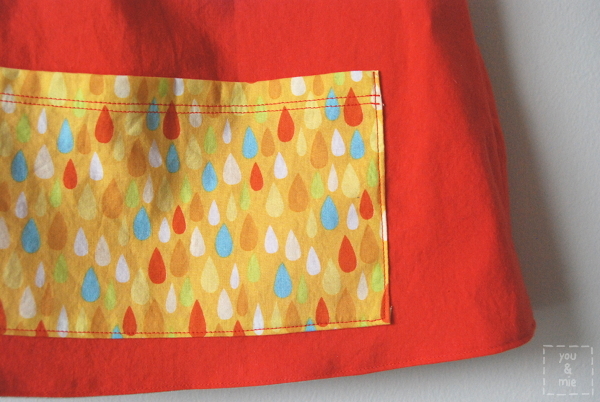 I chose a bright reddish-orange to go with this cute raindrop fabric. 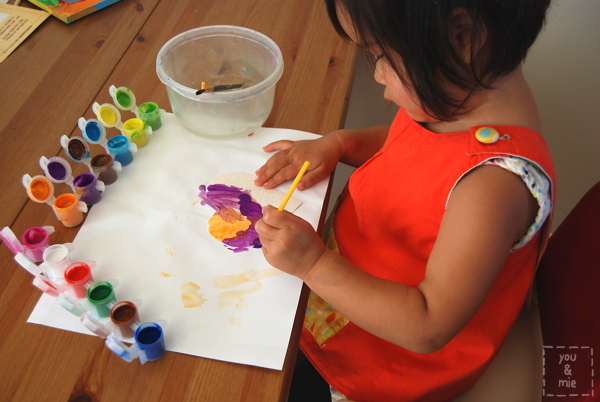 Somehow when I saw the fabric, it reminded me of painting. The large pouch pocket is not part of the pattern, but something I added myself for Yuki to hold paintbrushes, chalk, pens or other art supplies in. The pattern comes with in seam pockets, which I omitted for this version, but is definitely a great option if you’re making this as a tunic. For the other side, I used a cream linen for the main fabric and some cute Japanese print that I got at Daiso (the Japanese equivalent to a dollar store) for the pocket and fabric covered buttons. I love the little pleat in the middle and the sweet criss crossed back. 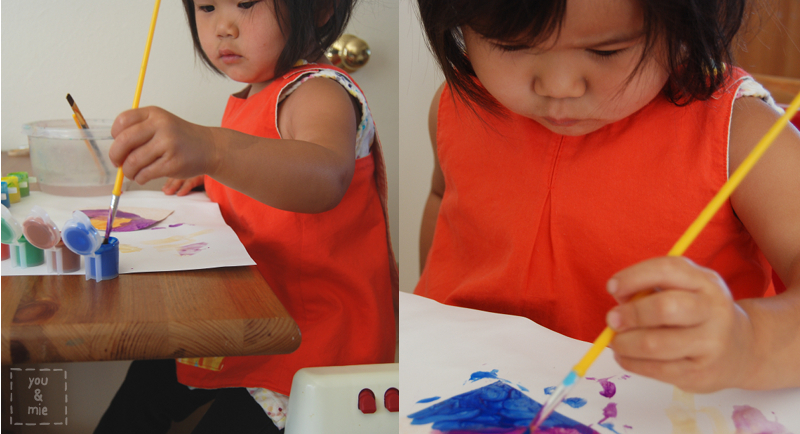 Unfortunately, I only got a few pictures of Yuki in the smock so far, but the fit is great and she loves having a special apron like mama! And it kept her shirt clean while being stylish! Score! I know she’ll get a lot of use out of this and I look forward to whipping up a few more! If you’re interested, you can buy the PDF pattern here. And be sure to check out all the other stops on the Roly-Poly-Along blog tour. 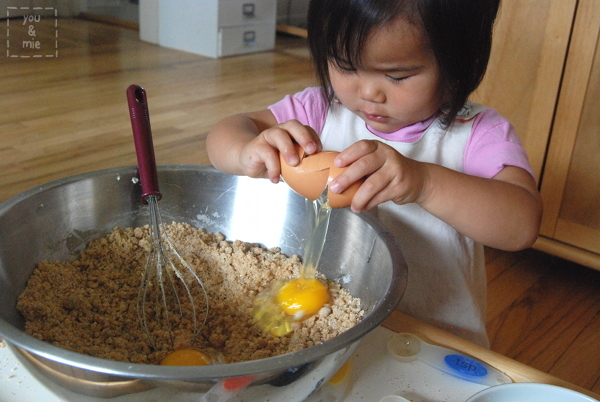 It started yesterday and will continue for three weeks! 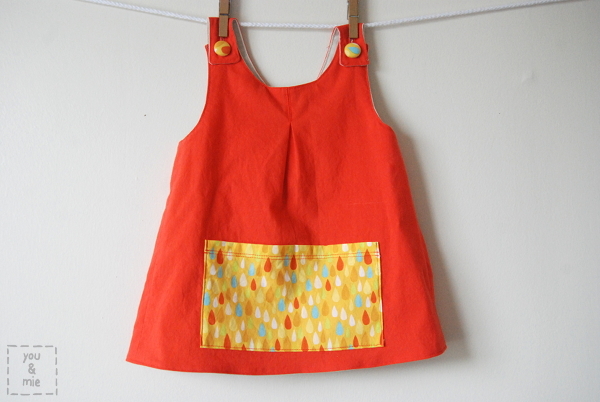 My current favorite is this adorable raindrop pinafore by Stephanie of The Crafty Kitty. TOO CUTE! And looking at the other bloggers joining the tour, I know there is bound to be a lot of other awesome and creative pinafores. OH and many of them are giving away copies of the pattern too (like the link above), so be sure to check out details on the blogs for your chance to win! 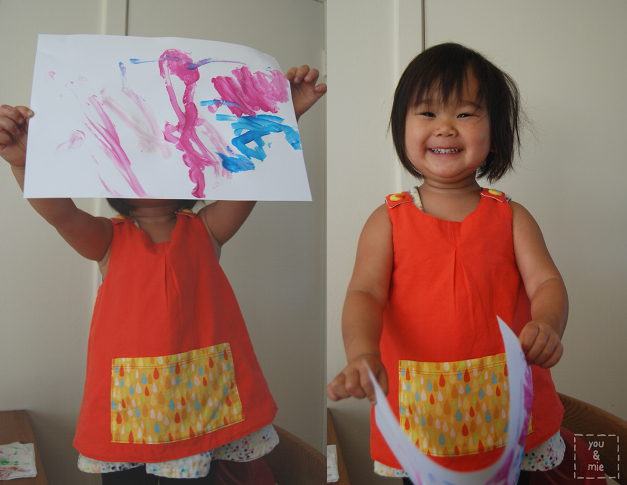 Thanks Rachael for the awesome pattern! !